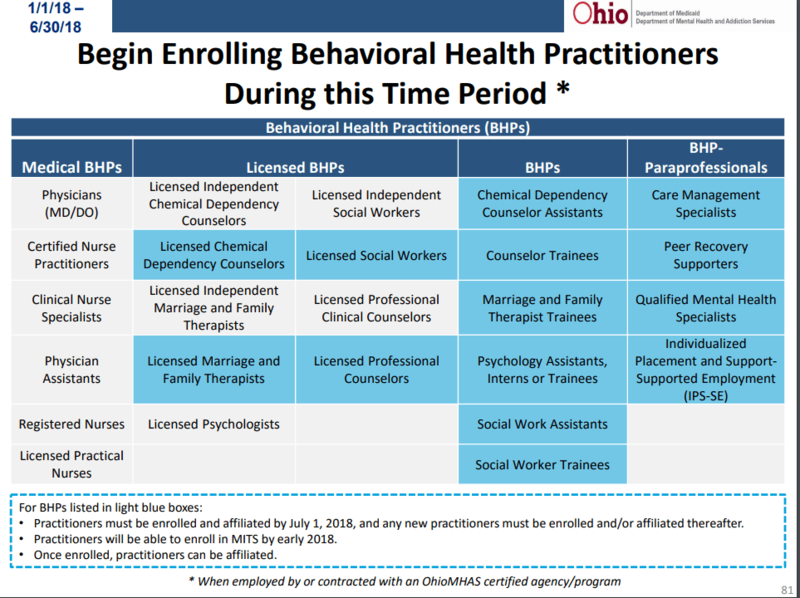 The first BH Redesign 501 Training occurred yesterday and new BH redesign info was announced. The slides can be found here. Below are some important points. There was some new information shared yesterday so I want to cover, at a minimum, the critical points related to the Redesign. 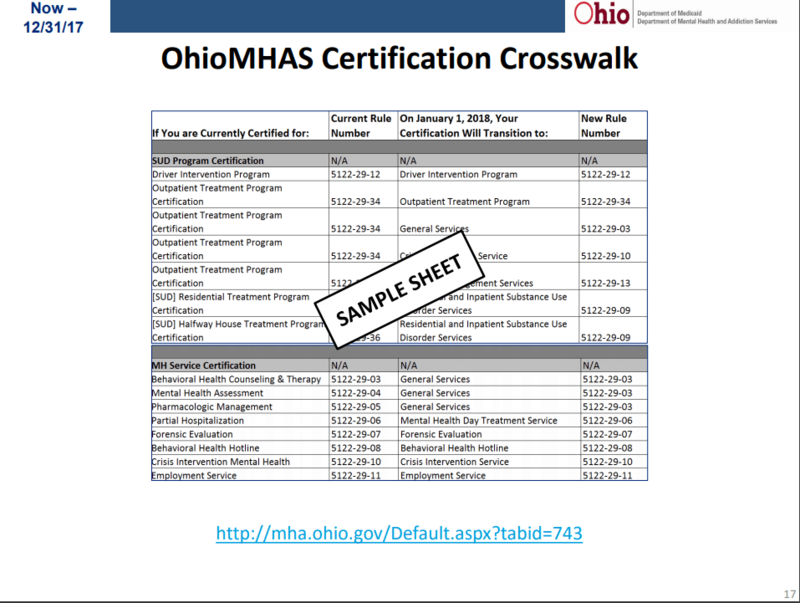 The OhioMAS Certification process and crosswalk were covered in detail. The crosswalk documentation is available here. 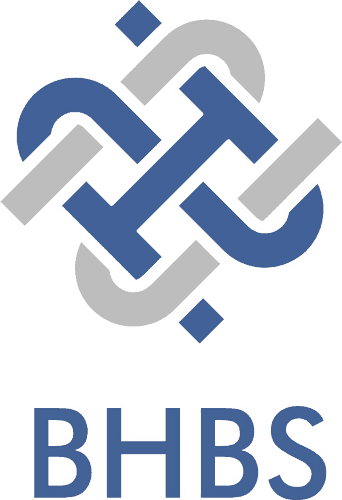 In addition, several policy updates were announced or reintroduced. 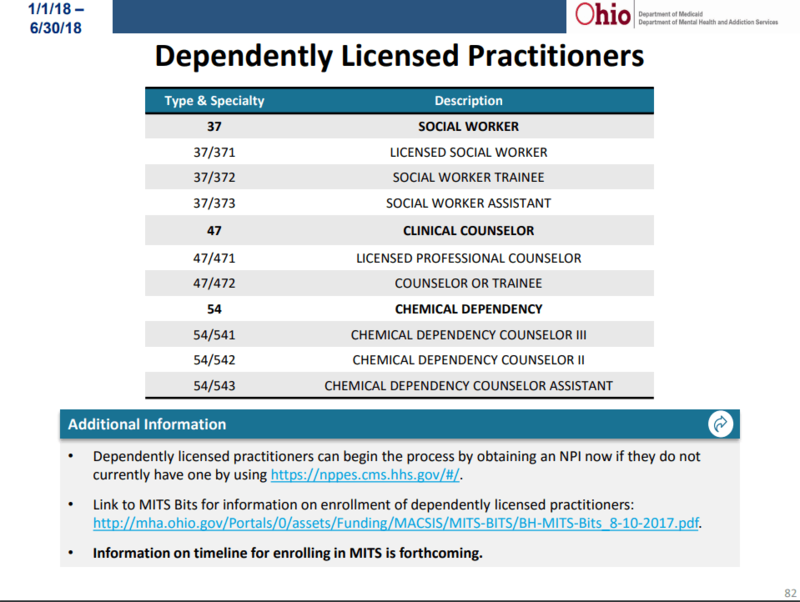 First is the temporary measure to address NCII edit issues for dependently licensed and paraprofessional providers between January 1st and July 1st, 2018. 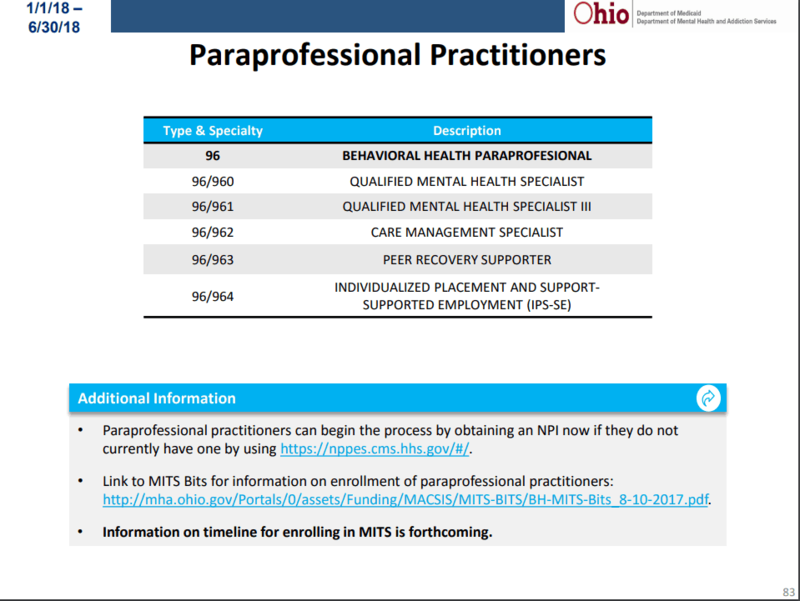 Next the new policy about registering dependently licensed and paraprofessionals was reiterated. 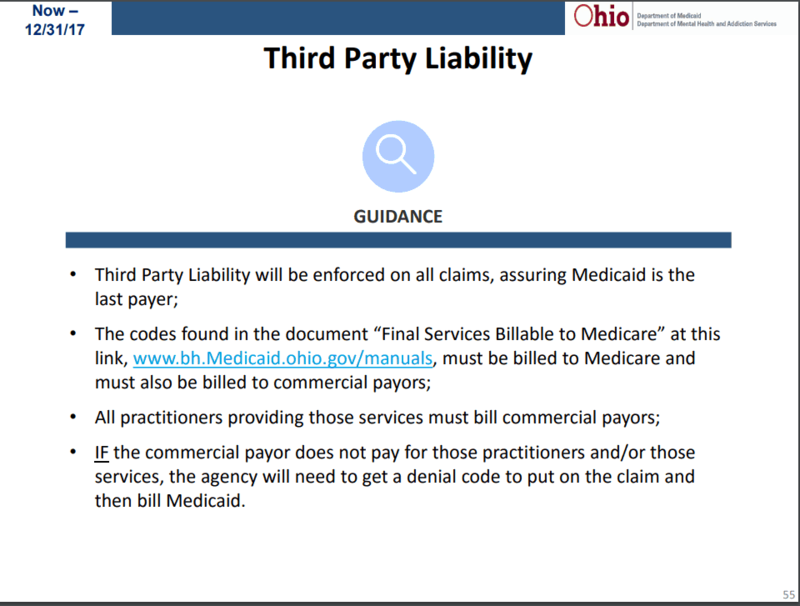 A new addition to this policy is related to a specific set of providers in particular circumstance. 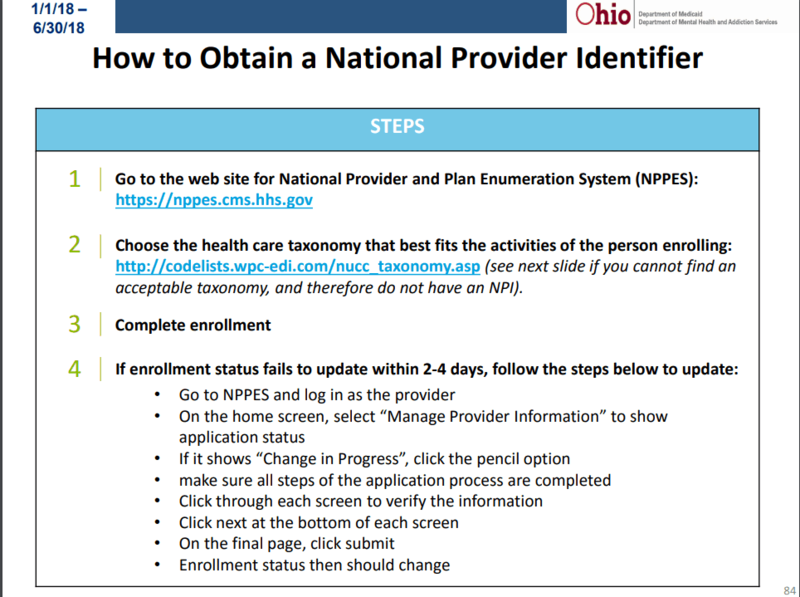 When enrolling in NPPES, you have to select a taxonomy code that is appropriate to the services the provider will offer. 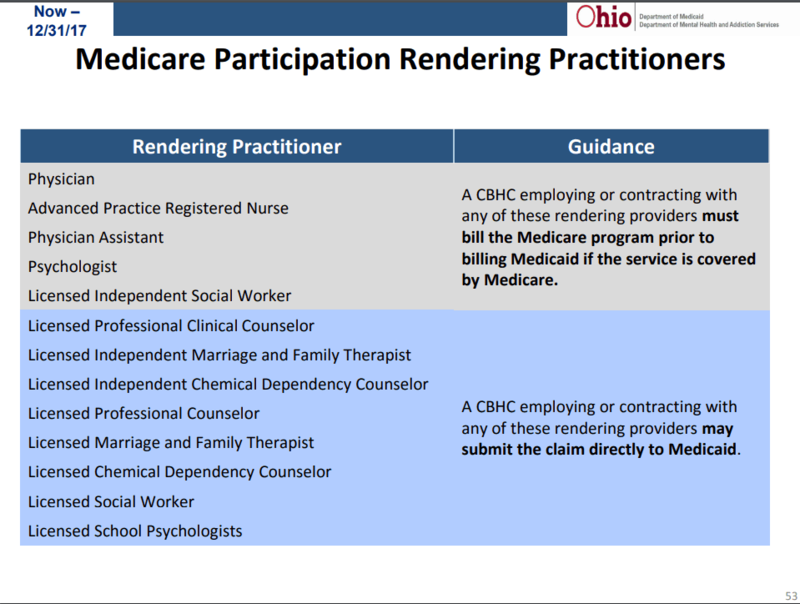 IF a provider is one of the types listed in the slide below and ONLY offer one of the types of service, they can register with Medicaid without an NPI and the assigned Medicaid number will be used in the NPI field. 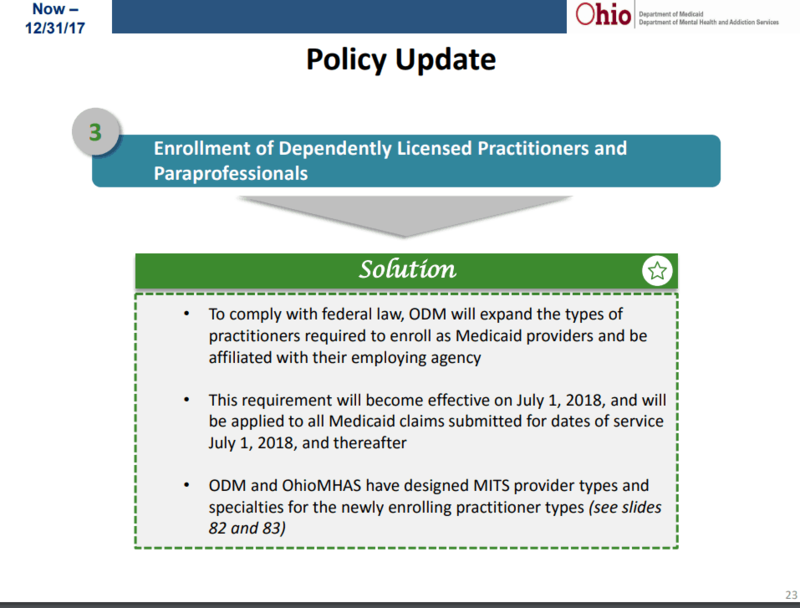 I’m sure more info will be provided as we move toward July 1st, but this was new information to me and important because I have received a number of questions from agencies on the appropriate taxonomy to use for these types of providers. 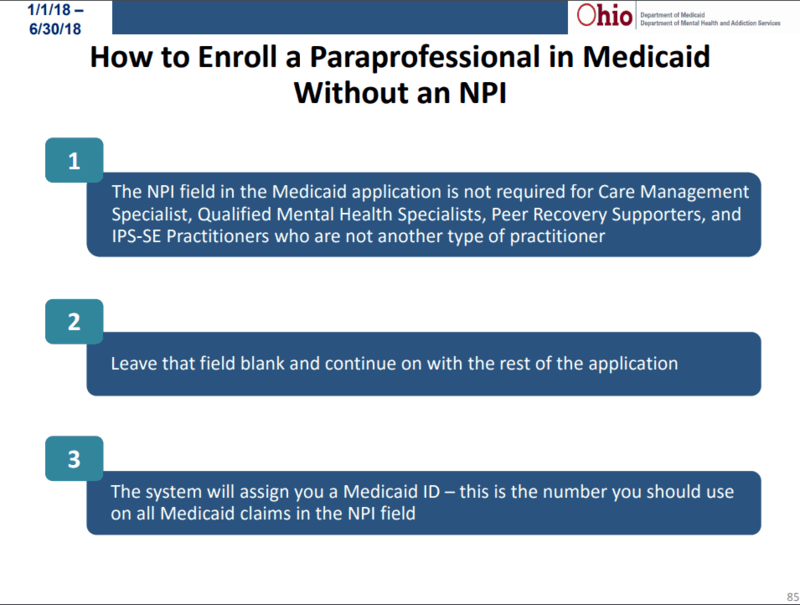 In addition, they provided the specialty type for all of the new providers required to enroll and provided some tips for enrolling for an NPI in the NPPES system. There have been reports of a lag time but it was reported that if you experience a delay and follow the steps below, it should assist with this process. Additionally, the new policy related to same day services for a doctor and nurse was reiterated. There also was discussion around when it is necessary, based on the provider of the service, to bill the service to Medicare and Insurance. The list below separates out who must bill direct to Medicare and who can bill direct to Medicaid. However, they made an important distinction that this list does NOT apply to commercial insurance. I’m currently testing this scenario and will update once my tests are responded to as this was not my understanding of this process and I have asked the question every way I can think of. The next policy update was not new but it did include additional information. 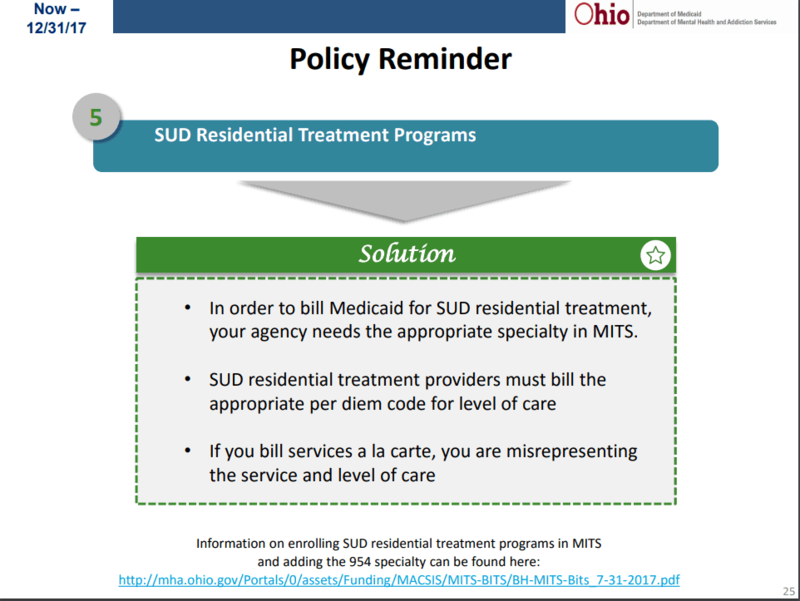 It pertains to the new SUD Residential Medicaid type 954 that providers must register. 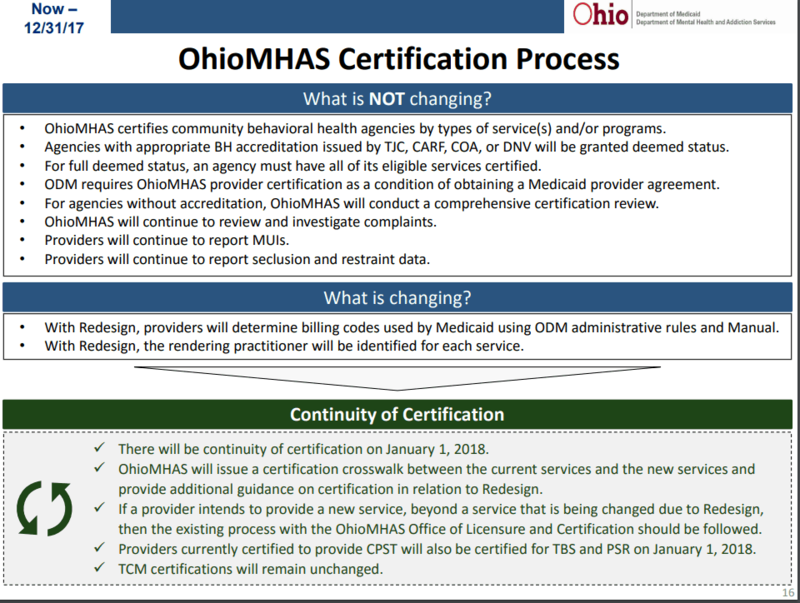 However, it added a caveat that providing fee for service ala cart in a residential setting is misrepresenting the level of care being provided. 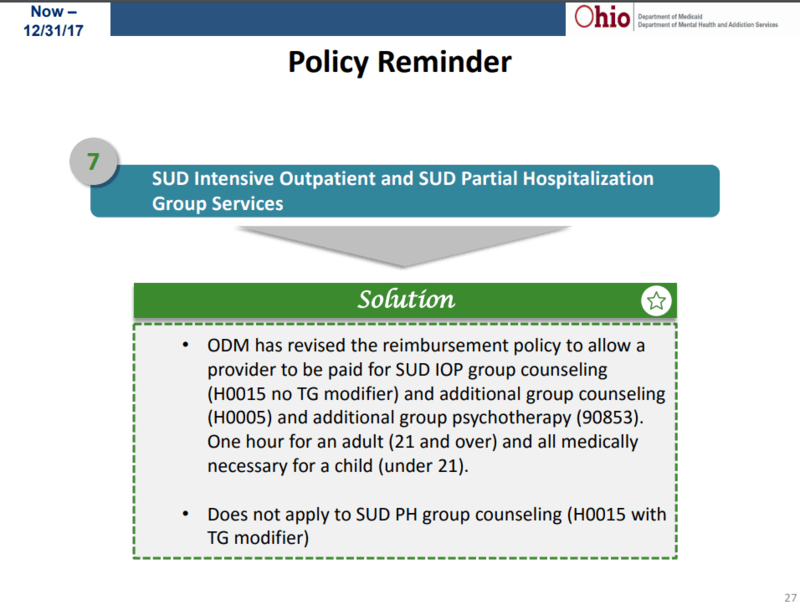 The next policy update pertained to SUD Intensive Outpatient Services and the ability to bill an additional group service on the same day as the IOP Service. This does not apply to Partial Hospitalization. 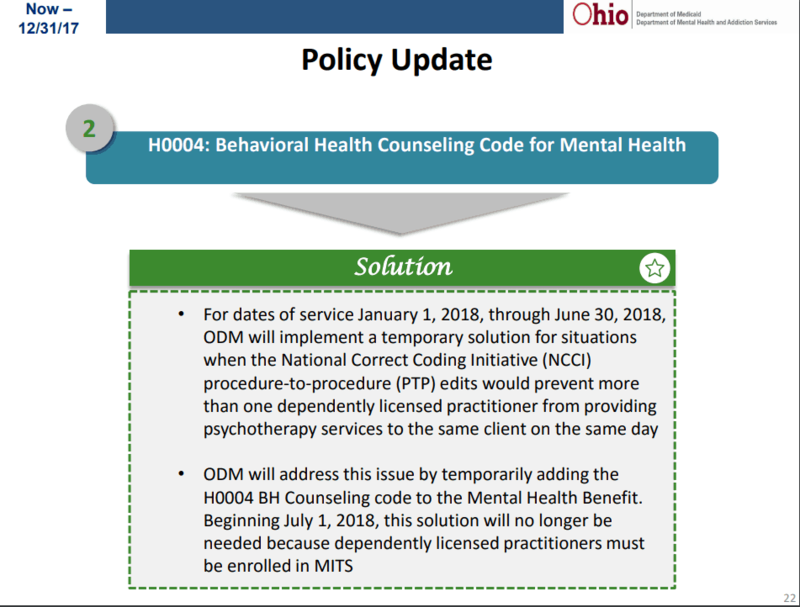 A similar policy was put in place for MH Day Treatment. It also states that 2 MH Day Treatment services can be billed in the same day IF the provider is different. 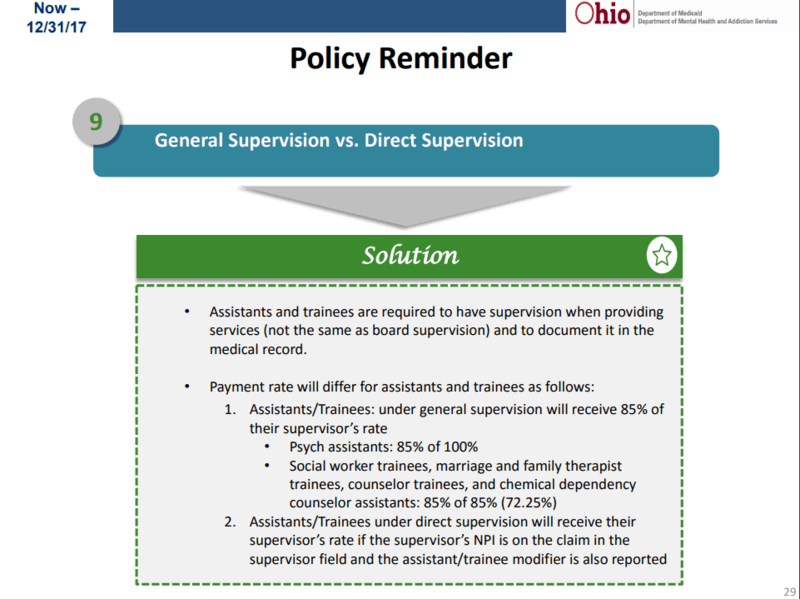 The next policy update pertains to supervision. 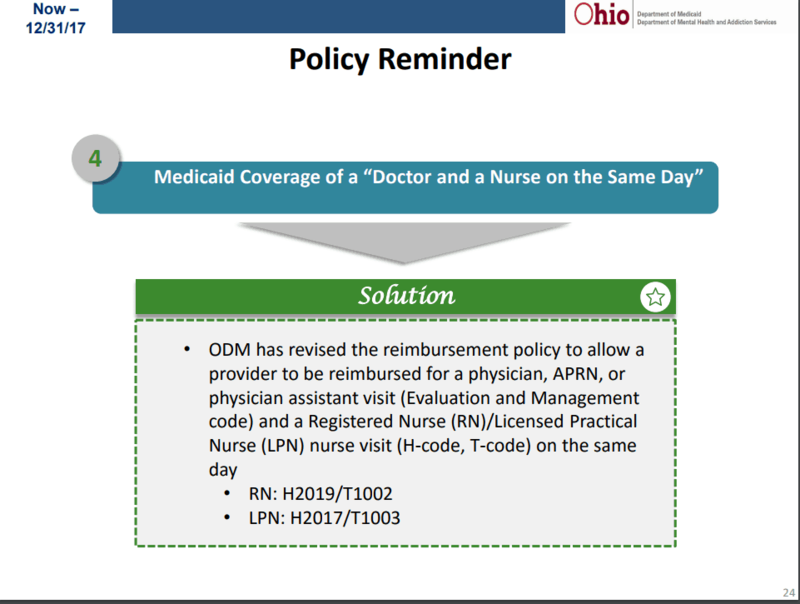 Discussion occurred about whether or not Medicaid requires the supervisor to sign the note IF an assistant or trainee provides the service under direct supervision. The answer was no but the supervisor must be on-site and interruptible. However, we did receive clarification from the actual rule. The full details on the new rule pertaining to when supervision is in 5160-8-05 and is available here. 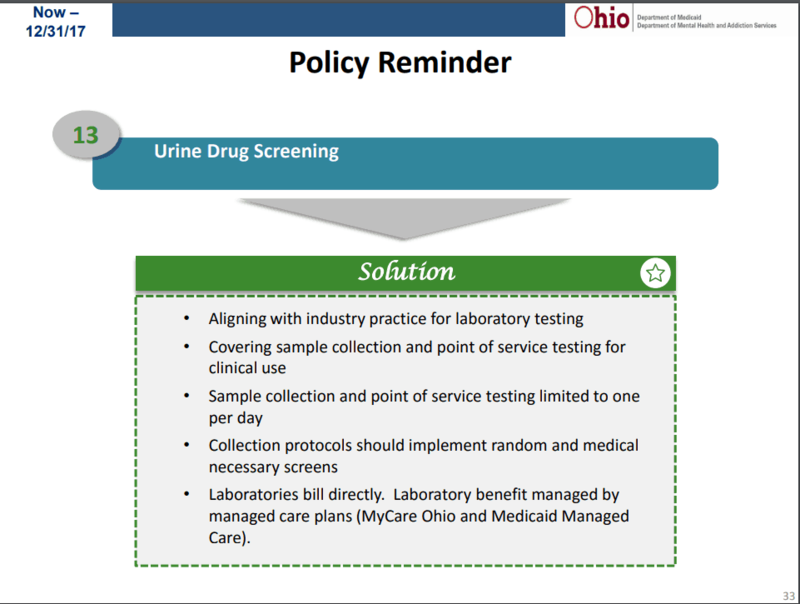 The significant change to the policy surrounding Urine Drug screens was also reiterated. Essentially, it states that the urine screens can only be completed once per day and the fee covers the process of urine collection. The lab will be able to charge for the actual processing of the test. In addition, Beta testing and overall testing for the redesign was discussed. One point was clarified and that is if you wish to be a Beta Tester, you can follow the steps identified below through November 30th. The process for registering to be a Beta testing is still open and will remain open throughout the testing period of 10/25/2017 – 11/30/2017. Beta testing scenario’s are available here. And they specifically stated that you can send a test file (all tests must be an EDI submission) through 11/30/2017 at 11:59 pm. I do intend to test that because testing earlier in the year actually cut off several hours early. 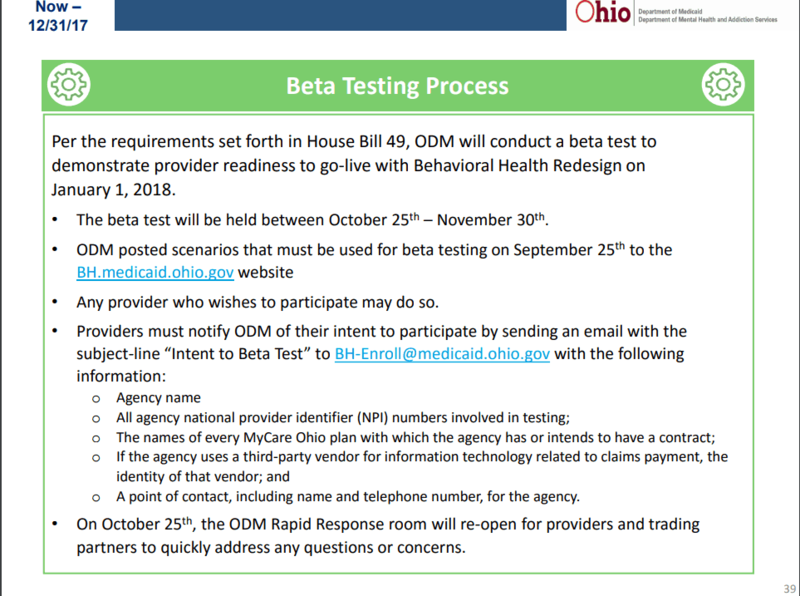 My recommendation is to test as soon as possible and test frequently remembering that services requiring a prior authorization will deny if testing through MITS as they cannot, at this time, accept a fake authorization number. Most Managed Care can so I would test those services through MCO’s to ensure your set up is correct. So to summarize all of this, it’s an important training to attend. Make the time to send the appropriate staff members including clinical and billing personnel. The information to register for the remaining training’s is available here.